Harpist/singer Carol Calvert and I (we call ourselves Shimmer) had a sweet experience playing with Joseph Salack on upright bass at the Everyday Center for Spiritual Living on 8/5. What a great service! They truly are “a loving, inclusive, omni-denominational community where we empower each other to live Joy-filled lives EVERY day.” Their celebration is offered every Sunday in the beautiful and acoustically awesome Rivera Chapel of Light located at 417 E. Rodeo Road, SF 87505 . What fun to have upright bass! Joseph Salack is the music director for ECSL and kindly jumped in to play with us. Thanks to all our friends for coming to hear Jim Harlan and me at Winterowd Fine Art last Friday! What a sweet scene it was. Check it out. How fun is this? I get to play with three very talented friends, each in different venues this weekend. I’d love to see you! Friday August 3 from 6pm – 9 pm: Modal improvisation with pianist Joseph Salack at Upper Crust in ELDORADO (not downtown) from 6-9 pm. Hear a sample. Sunday morning 8/5 at 10 am: I’ll play with harpist/singer Carol Calvert at the Everyday Center for Spiritual Living. Have you experienced the Kiva at the Rivera Chapel of Light? It’s amazing. Sample our music. 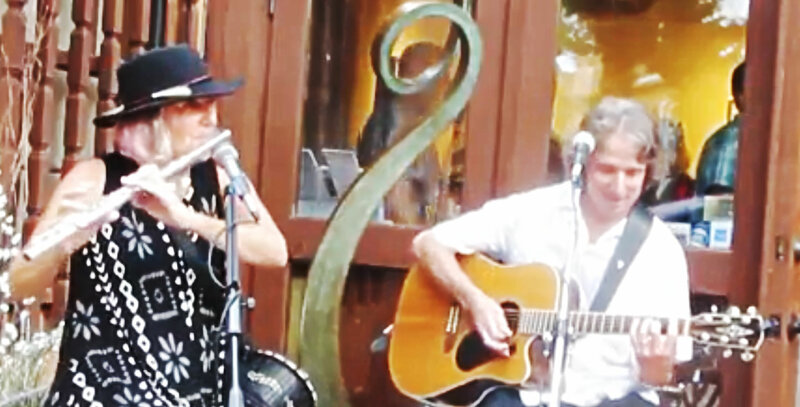 Sunday afternoon 8/5 from 2 – 4 pm: Jim Harlan and I will play for the Santa Fe Society of Artists at 122 W Palace Avenue, just west of the Plaza. Sample our music. We’d all love to see you! Thanks to all our peeps who came. What a sweet surprise you were. Wasn’t it fun?? Will you be in town Friday, July 20? If so, stop by Winterowd Fine Art at 701 Canyon Road between 5 and 7pm. You will be able to meet the wonderful artists represented by Karla Winterowd, during a Group Exhibition called Force of Nature. Jim Harlan will accompany me on guitar. He’s so fun! About the clip below: A few musical friends camped out on a cool night at Ghost Ranch in May ’18. Ilan Shamir patiently held an iPhone for this video of me and Jim Harlan until we noticed that Ilan was falling asleep which was hysterical! This tune is a mash-up of House of the Rising Sun with lyrics from Amazing Grace. The white square in the middle is a solar light. The flickering light is our campfire. Such a fun night! 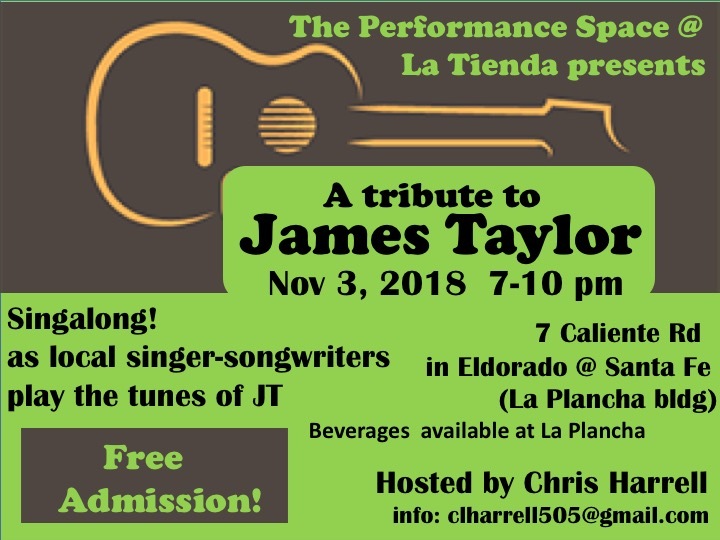 FYI, on the off chance that you’ll be downtown this Sunday 9/2, Jim and I will serenade the artists and visitors at the Santa Fe Society of Artists show just off the plaza, from 2-4pm.